ALBANY — Control of the State Senate hinges on nearly a dozen races that could wrest a half-century of majority control from Republicans or strengthen the GOP’s check on Democratic dominance. 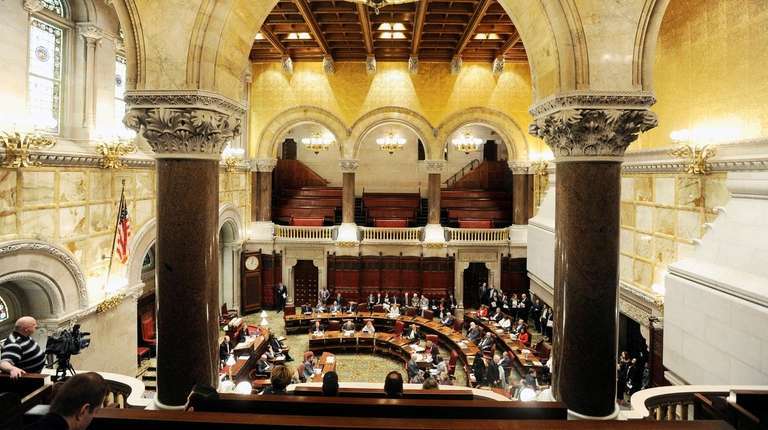 In Albany, majority control means control of legislation. Democrats promise they would pass stronger abortion laws and single-payer health care, legalize recreational use of marijuana, assure more rights for lesbians, gay and transgender people; more gun control and early voting, among measures that long have been blocked by Senate GOP. Republicans promise more property tax breaks and a greater focus on bread-and-butter issues such as job creation and school safety, and say they are the only check on Democrats’ liberal causes. The pivotal races, including four on Long Island, all have factors that make them potential linchpins for Senate control, according to political strategists. Those include close voter enrollment; open seats created by the retirement of five Republicans, and what some experts said will override them all — voter sentiment for and against President Donald Trump. Democrats need a net gain of just one seat to take control of the 63-seat chamber where 32 votes control legislation. But Republicans, disciplined and well organized in every county, have seen this threat before over recent election cycles. Assemb. Dean Murray (R-East Patchogue) is hoping to win a vacated seat — long held by Republicans — against Suffolk County Legis. Monica R. Martinez (D-Brentwood). The 3rd District seat is up for grabs because the incumbent, Sen. Tom Croci (R-Sayville), resigned this year to return to active duty in the U.S. Navy. Democrats see this as a great opportunity in a district with 68,285 Democrats to 59,135 Republicans and are funding it as a top priority. But voters in the past have chosen conservative Republicans, including Croci and current Rep. Lee Zeldin (R-Shirley). In the 5th Senate District, which includes parts of Nassau and Suffolk counties, Sen. Carl Marcellino (R-Syosset) is seeking re-election to the seat he’s held since 1995. He faces Democrat James Gaughran, chairman of the Suffolk County Water Authority, in a rematch from a close 2016 contest. Each side is transferring big campaign contributions to their candidates in the final days. In the 8th Senate District, which also takes in parts of both counties, Sen. John E. Brooks (D-Seaford), a former Republican, is seeking his second term, running against Massapequa Park Mayor Jeff Pravato, a Republican. Despite its Republican voting history, the district has 90,046 Democrats to 78,227 Republicans and 2,842 Conservatives. Sensing a good chance to flip a seat, the Senate Republican Campaign Committee gave $396,000 to Pravato. As a counter, Brooks has courted the African-American communities in Roosevelt and Latino communities in Freeport. In Nassau County, Republican Sen. Elaine Phillips of Flower Hill is facing her first re-election bid in the 7th District, against Democrat Anna Kaplan, a member of the North Hempstead Town Board. Democrats have an edge of more than 20,000 voters over enrolled Republicans, but Phillips is counting on the endorsements of the Conservative and Independence parties. Headed into the final full month of campaigning, Phillips had $477,553 in her campaign account after spending $409,000 the month before; to $165,591 for Kaplan at the beginning of October. Sen. Martin Golden (R-Brooklyn) is seeking another term after 15 years serving the 22nd District, which has 47,000 more Democratic voters than enrolled Republicans. Democrat Andrew Gounardes is hoping to defy years of dashed Democratic hopes to unseat Golden and will have the considerable clout of Gov. Andrew M. Cuomo at his side as well as voters’ antipathy for Trump, who lost the borough 6:1 in 2016. Golden, a former New York City police officer, counters with a long tough-on-crime record in the southern Brooklyn district. Republicans see a long but legitimate shot in a four-way race in the 11th District in Queens, and they can thank Democrats for it. Sen. Tony Avella (D-Whitestone) lost the September Democratic primary to former city comptroller John Liu. It was a nasty fight that divided Democrats over Avella’s membership in the now-defunct Independent Democratic Conference that allied with the Republican majority. But Avella will get a rematch Nov. 6 running on the Independence and Women’s Equality parties’ lines. Republicans hope that will provide a path for Vickie Paladino to win in the district, which is 3:1 Democratic, in a year in which more women are running for election. But Paladino won't have the Conservative line, which is being used by Simon Minching, who Paladino beat in the Republican primary. The 39th District seat vacated by Sen. William Larkin (R-New Windsor) after 28 years could be the pivotal in the fight for majority control. Three-term Democratic Assemb. James Skoufis is seeking the Newburgh-area seat against Tom Basile, a town councilman in Stony Point and former executive director of the state Republican Committee. Skoufis had $309,910 in his account earlier this month to Basile’s $32,943, but that was after Basile spent $141,288 on TV advertising, state records show. Democrat Karyn Smythe of the Poughkeepsie area is one of the handful of candidates being directly backed by Cuomo. Smythe is trying to upset Republican Sen. Sue Serino of Hyde Park, who is finishing her first term, in the 41st District. Democrats have an edge in the district, but Serino is courting the substantial number of voters from the Independence and Conservative parties. Democrats are also pouncing on an opening in the historically Republican 43rd District near Albany after Sen. Kathleen Marchione (R-Halfmoon) retired this year. Her aide, Daphne Jordan, is seeking the seat against Democrat Aaron Gladd, an Army veteran who served in Afghanistan. The district still has nearly 5,000 more Republicans than Democrats and is bolstered by 6,010 Conservative voters, but Gladd has a big money advantage. Going into the final full month of the campaign, he had $260,717 in his account after spending $193,043 the month before. Jordan had $35,249 in the campaign account earlier this month, after spending just $13,050 in September.